The item Rocketeer adventures, Issue 1, (ebook) represents a specific, individual, material embodiment of a distinct intellectual or artistic creation found in Charlotte Mecklenburg Library. The Rocketeer flies again! Dave Stevens unveiled the Rocketeer nearly 30 years ago to instant acclaim, and in all the years since that auspicious debut, respect for Dave's talent and his greatest creation have only continued to grow. Last year, IDW had the honor of releasing the complete Rocketeer saga in several editions, showcasing the work of this great artist as it was always meant to be seen-completely remastered, with nearly every page scanned directly from the originals and recolored by Dave's hand-picked colorist. Today we are able to celebrate Dave's talent once again, with an all-new Rocketeer anthology miniseries written and drawn by some of the finest creators in comics, and with the full cooperation of the Stevens family. 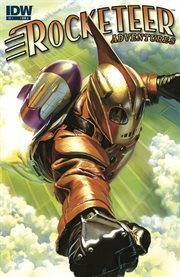 The first star-studded issue of The Rocketeer features a gorgeous cover by Alex Ross, and terrific stories by John Cassaday, Mike Allred, Kurt Busiek, and Michael Kaluta, plus pin-ups by Mike Mignola and Jim Silke -- all paying tribute to the continued legacy of Rocketeer and Dave Stevens!